HALLOWEEN & THE LCS COMICNOMICON! 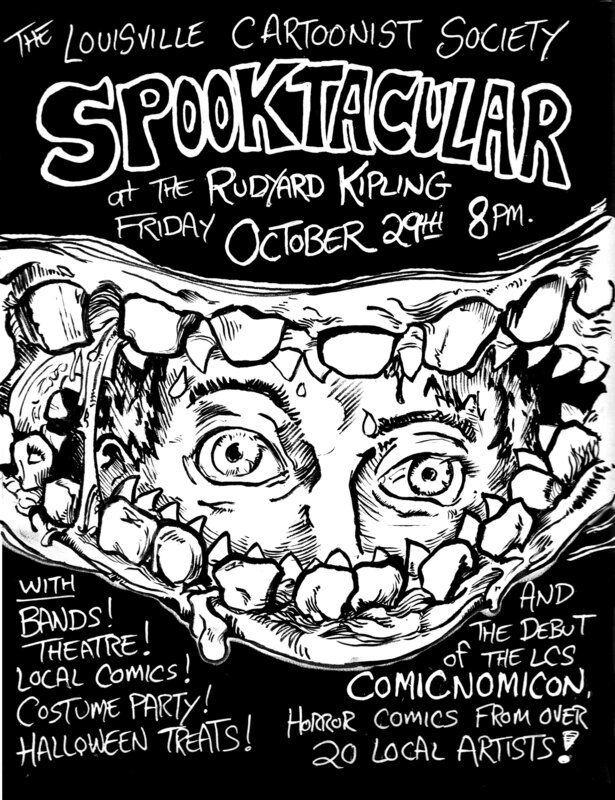 Join us in the midst of the macabre for the LCS Spooktacular at the Rudyard Kipling, 9 pm, October 29th! We’ll be releasing the COMICNOMICON, a Horror Comic Anthology over 90 pages long and with over 20 local artists! It’s a scream. Also- performances from Montag and Softcheque, plus improv from the Ballroom Brawlers, A Costume Contest, and more! 7 dollars at the door, 5 with costume. Check out the VELOCITY’s coverage here. And our blurb in the LEO is midpage here. COMICNOMICON! and LCS Halloween Spooktacular! The Louisville Cartoonist Society is proud to announce the COMICNOMICON has risen! Horror stories from over 20 local cartoonists- an over 90 page book, with front and back covers by local luminaries Jenevieve Broomall and Steven Bowman! Available soon all over Louisville and Beyond! AND join us for the LCS SPOOKTACULAR at the Rud! With bands SOFTCHEQUE, MONTAG, and the BALLROOM BRAWLERS. PLUS: There will be a creepy costume contest (with prizes! ), tricks, treats, a vile video show, and local comics! Come celebrate Halloween in style with the Louisville Cartoonist Society!